REMODELLED at the back end of 2017, Polaris’ Ranger line-up extends from two-seaters in electric and petrol variants to full size (three-seater) petrol and diesel options, through to six-seater crew cab versions. 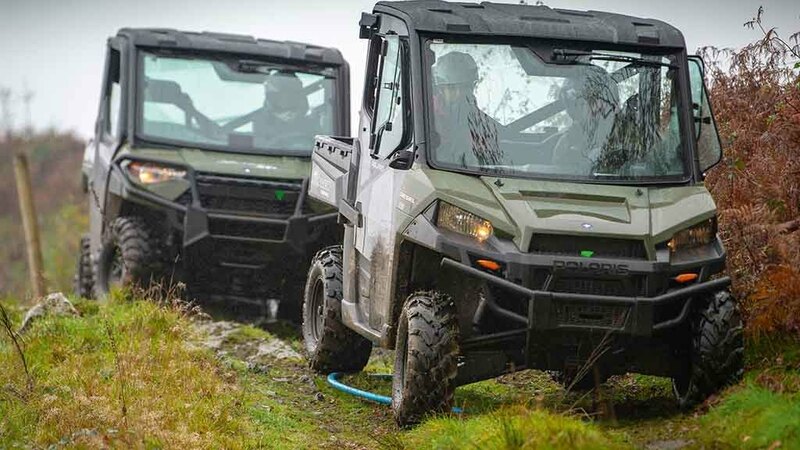 While all are said to be capable of tackling the rigours of farm life, we used the manufacturer’s latest product event to compare its full size petrol- and diesel-powered UTVs. The Ranger XP1000 is the most powerful in the range and features the company’s own two-cylinder 999cc engine delivering a gutsy 82hp. The Ranger diesel uses a three-cylinder, 1,028cc Kohler engine putting out 23.4hp. Both use a similar chassis, with the same wheel base, however, the plastic bodywork on the petrol UTV makes its overall dimensions slightly greater. As far as capabilities are concerned, both can lug 454kg in their cargo beds and overall capacity is 680kg. However, the petrol machine gets a big boost in towing capacity, at 1,134kg compared to the diesel at 907kg. The petrol also gets the upper hand in ground clearance and suspension travel, at 330mm and 279mm compared to the diesel at 305mm and 254mm respectively. These are small differences and are not particularly noticeable when driving, for one big reason. Diesel UTVs have long languished in the shadow of their sportier leisure-derived petrol cousins. However, manufacturers are making a notable effort to push petrol power into the agricultural scene, and for good reason. The extra performance gained from the pokey petrol makes driving it enjoyable and entertaining, instead of the fist-dragging diesel version. Gently putting your foot down in the petrol version is rewarded with a waft of speed as you and the machine glide along at a comfortable pace. In the diesel, stamping is required and all you are greeted with then is a raucous bellow from the engine, and little increase in speed. Both vehicles are demanding to drive. The petrol has so much power and can get to more than 70mph, says the company. Tempering of the foot pedal is needed, but it is easy to drive in a sensible manner. The diesel, on the other hand, needs route planning and the patience of a saint, waiting for it to lumber up hills. Coming back down a hill, the diesel has the advantage, with stronger engine braking and decent control keeping everything straight and grounded. The petrol is by no means dangerous going downhill, but it could get a little bit skittish with any amount of weight, only having the engine and no electronic wizardry holding it back. One thing must be said with regards to the transmission in both. When descending, the continually variable transmission needs some revs to keep it engaged. Counter-intuitive as it seems, feathering the throttle keeps it going downhill in a controlled manner. A dab of brake here and there and both machines offer little in the way of scares traversing a path down a slope. Steering on both is crisp and precise, with good feedback coming back up the steering column. The two machines tested had a similar level of spec in the cabin, and it is obvious Polaris has spent considerable time improving the interior. Well laid out controls and plenty of storage space, with the option of lifting the passenger seats, ideal for keeping the collies warm, make the Rangers a nice place for man and beast to be in on a bleak morning. The plastics will be easy to wash down and as everything in the cab is modular, the windscreen, doors and roof can all be removed, perfect for summer cruising. The range can be equipped with as many ‘mod cons’ as wished for, including electric windows, radio with Bluetooth connectivity and heaters. If we were picking a UTV, the petrol model would be our choice. Even though fuel for the diesel model is cheaper and easier to source, the company claims the petrol model, when driven conservatively, should only drink a bit more than a comparatively sized quadbike. Add to that the UTV comes with full road homologation as standard, a trip to the fuel station should not be too much of an issue. THE event also provided us a chance to try one of Polaris’ new ATVs. And it is clear to see the manufacturer is keen to exert more pressure on the ag sector and strengthen its position with its latest round of releases. The Sportsman range of ATVs encompasses many designs and styles, from the farm-spec Sportsman 570 starting at £5,839, to the six-wheel Sportsman 6x6 570, and up to the totally bonkers 90hp Sportsman XP 1000. Except for the company’s three performance models which use a 952cc twin-cylinder engine, the rest of the range features the same 567cc single-cylinder engine from Polaris, producing 44hp. The Sportsman X2 570 is probably the quad best suited to life on-farm, with a longer wheel base, larger rear rack capacity and more tech for navigating difficult terrain. The engine is punchy and smooth running. Its 44hp output is responsive and plenty powerful enough for climbing steep banks and dealing with slippy rocks. Coupled to the continually variable transmission and the company’s all-wheel drive system, traction is rarely an issue. Versatility is the name of the game with the X2. While the rear load area can tip its load, the floor of the bed also doubles up as a back rest for a passenger. The process is simple. Pulling forward on the back of the driver’s seat gives access to the floor of the load bed, which is lifted up and locked in position by dropping the driver’s seat back down. Selecting which traction mode you want is also easy, just toggle through the options which pop up on the screen and select the most appropriate. Selecting the on demand all-wheel drive mode sees the quad running in two-wheel drive until it senses slippage, at which point it will then engage fourwheel drive. 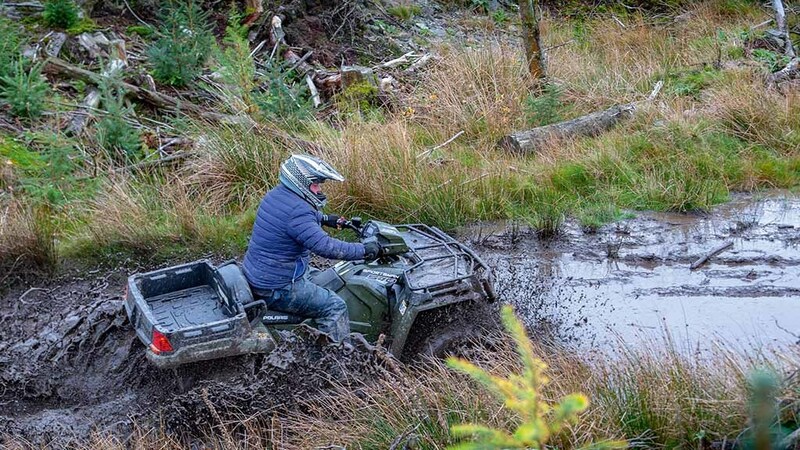 Most of the time the quad stays in two-wheel drive, only occasionally slipping into fourwheel drive when the going gets really tricky. The gearbox feels robust, giving a good ‘clunk’ as it slips into gear. The gear lever, however, is in the wrong place and it frequently ends up giving you a good crack on the knee cap when you get on or off the quad. The storage box on the front of the bike is cavernous, offering 31 litres of dry storage. While some may like this option, for sticking medicine bottles, bale twine and other farmyard essentials in, others will miss the sturdy metal rack it has replaced. It still offers 40kg of weight capacity on top of it, but for any slightly rough drivers, we do not see it lasting as long as a robust metal rack. The quad is an impressive performer, with plenty of power and torque, ideal for climbing up steep hillsides. It is as handy for carrying a passenger as it is for lugging feed, with the added benefit of being able to tip it out, saving your back. The front box is a great addition if you are careful, but if the operator is gung-ho and inadvertently slips into gate posts regularly, the plastic lid could soon become shabby. In all, the bike is another one to put on the list to try if you are in the market for this sized machine.